$120.00 Portrait of Lenin by S. Loch, a very detailed print rendered on tightly woven canvas, mounted securely on a wooden support frame; not recently made but may be post-Soviet. $60.00 Lenin's Lithographic Portrait on cardboard, circa 1950s-60s. $30.00 Lenin seated in a chair, large reproduction of a well doneoil painting printed on heavy and glossy art paper. Intended for office and classroom use. $29.00 A benevolent and contented Lenin wears one of the earliest Soviet flag pins. High quality portrait print by P. V. Vasilev on heavy, glossy art stock dates from 1988. $25.00 Lenin portrait by Soviet artist P V Vasilev, done in 1967 in pencil or Conté crayons. Part of the campaign to make Lenin appear friendly if not actually benevolent. High quality art print made in 1990. $55.00 Grampa Lenin - probably the best known of all the portrait-posters done in an attempt to make Lenin accessible to young children. 19 1/4" x 26 3/8". Dated 1978. $70.00 Thoughtful, dream-like Lenin features on a 22 April 115th birthday poster. "The thoughts, words and deeds of Ilyich spread over the universe." Note the spelling of his name in other, non-Cyrillic alphabets in the borders. 25 1/2" x 38". 1985. 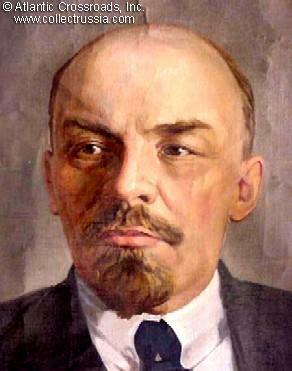 $80.00 Portrait of Lenin, silk tapestry, circa 1940s-50s. $395.00 Large Lenin Lacquer portrait box from Fedoskino, probably the most famous center for such work in Russia, dated 1960 and signed by the artist. This outstanding, relatively early example of Soviet propaganda art is in superb condition. $85.00 Lenin Desk Portrait features image of the Bolshevik leader wearing a Central Executive Committee lapel Badge, 1970 jubilee issue. In near mint condition and comes with manufacturer's cover sheet. $200.00 Lenin portrait plaque based on a May 25, 1919 b/w photograph, Dulevo,post 1968. Freestanding with an integral easel. $50.00 Lenin Birth Centennial 1970 commemorative freestanding porcelain plaque, Polonnoe Artistic Ceramics Factory. $120.00 Lenin Vase, Gorodnitsa Porcelain Factory, circa 1962-70, large porcelain vase probably produced to commemorate the Centenary of Lenin's birth in 1970, 11" high (28cm). $90.00 Porcelain Plate "Lenin during the Revolution", Budy "Hammer and Sickle" Faience Factory, mid 1950s - 1967. Dramatic image shows Lenin giving orders over the telephone. $80.00 Lenin portrait porcelain plate, Korosten, 7" diameter, 1962-1990, undated but possibly a 1970 Lenin Birth Centennial commemorative. One of the most popular Cold War images of Vladimir Ilyich. Excellent condition. $120.00 Decorative Porcelain Plate with Portrait of Lenin, made in Czechoslovakia, circa 1970s. A very high quality propaganda piece, most likely produced to celebrate the centenary of Lenin's birth in 1970s. $40.00 Postcard with very early portrait of Stalin by I. Brodsky. Printed in 1933. $59.00 Color plate of the oil painting "Stalin in Exile in the Village of Turukhanskaya 1916"
$45.00 Mikhail Kalinin, 1985 poster portrait of the Chairman of the Presidium of the Supreme Soviet of the USSR from 1919 until 1946. Highest quality print on glossy art paper. $40.00 Photo Nikita Khruschev during state visit to India, 1960. $48.00 Official photo: Nikita Khruschev with Antonin Novotny in Prague, during Czech-Soviet friendship rally. August 1964. Soon both would be unemployed. $40.00 Leonid Brezhnev, leader of the USSR from 1964 until his death in 1982. Large official portrait dates to 1979. Created for use in offices, public buildings and school rooms. $15.00 Soviet Premier Leonid Brezhnev, b/w portrait poster, 1976 issue. $160.00 Oil Portrait of Aleksei Kosygin (1904 - 1980), Premier of the Soviet Union from 1964 to 1980. Large 35 ¼" x 27 ¼" image.